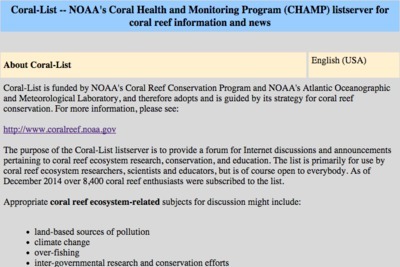 The Coral-List listserver provides a forum for Internet discussions and announcements pertaining to coral reef ecosystem research, conservation, and education. 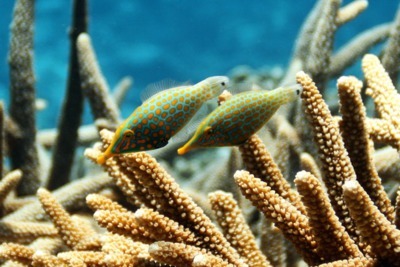 The list is primarily for use by coral reef ecosystem researchers, scientists and educators, but is open to everybody. The Coral Literature Education and Outreach (CLEO) project provides easy access to gray literature on coral reef environments near the ICON/CREWS monitoring stations. 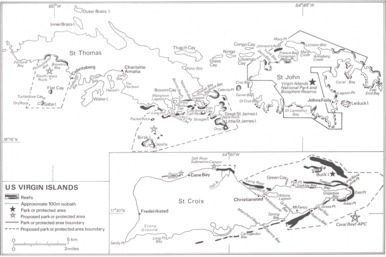 These maps, from the book Coral Reefs of the World by Susan M. Wells, are posted with permission of the publishers IUCN Conservation Monitoring Center and United Nations Environment Programme (UNEP). UNEP/IUCN (1988). Coral Reefs of the World. Volume 1: Atlantic and Eastern Pacific. 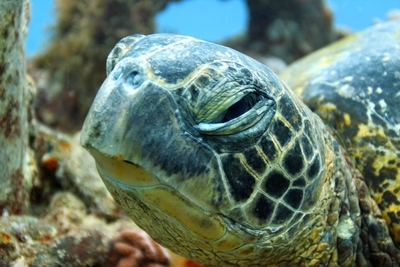 UNEP Regional Seas Directories and Bibliographies. IUCN, Gland, Switzerland and Cambridge, U.K./UNEP, Nairobi, Kenya. ISBN: 2-88032-943-4. UNEP/IUCN (1988). Coral Reefs of the World. Volume 2: Indian Ocean, Red Sea and Gulf. UNEP Regional Seas Directories and Bibliographies. IUCN, Gland, Switzerland and Cambridge, U.K./UNEP, Nairobi, Kenya. ISBN: 2-88032-944-2. UNEP/IUCN (1988). Coral Reefs of the World. Volume 3: Central and Western Pacific. UNEP Regional Seas Directories and Bibliographies. IUCN, Gland, Switzerland and Cambridge, U.K./UNEP, Nairobi, Kenya. ISBN: 2-88032-945-0.